Many children are soothed and calmed by the means of a pacifier. Sucking on a pacifier is a natural and normal thing for a child as it is a part of their reflexes learned by the instinct of breastfeeding. Sucking on pacifiers, as well as other items, such as their thumbs, fingers, and random objects helps them to feel secure and content. Many children use the reflex of sucking as a security blanket as they go about learning and exploring the world. This act helps to relax them and can also help them fall asleep. In fact, the American Academy of Family Physicians (AAFP) states that pacifiers have a positive influence on children that are from the ages of one month until six months of age. The problem many parents experience with their children is knowing when enough is enough. 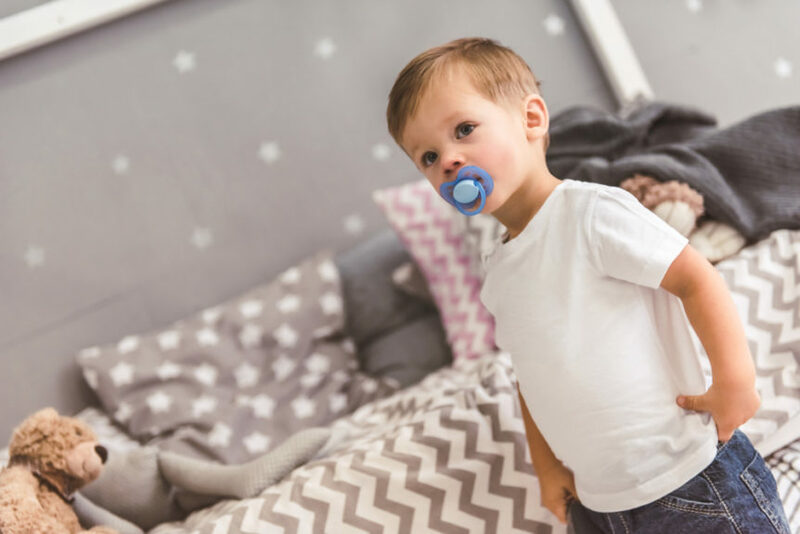 There is an age in which your child should begin to separate from the pacifier and sucking on other objects or it can begin to cause damage to the growth and alignment of their teeth. Not only can it affect the child’s teeth, but it can cause negative changes in the formation of the roof of the mouth. Pacifier sucking as well as thumb sucking can cause a lot of damage to the formation of your child’s mouth if it isn’t stopped by a certain stage of their development cycle. It pulls the child’s front teeth forward which causes disruptions to the bite as well as tooth and jaw position and alignment. When should children stop using a pacifier? of ear infections in children can cause permanent hearing damage. As for thumb sucking, the habit should be broken around the same time, two years old. Children often naturally move away from pacifier and thumb sucking around the age of two. When it comes to thumb sucking, it should be strongly discouraged after the age of four, although it is recommended to be discouraged at two years of age. You should induce the habit of sucking on a pacifier at a young age over thumb sucking as the ladder is a more difficult habit to break. Overall, one of the most important things you can do is ensure your child goes for regular checkups to their dentist. From a trusted family dentist in Irving, here at Cosmetic & Family Dentistry, we would love to help you with your family’s dental needs. If you have questions or would like to set up an appointment, contact us today.